Air & Style took off this weekend at the Munich Olympic Stadium with a crowd of 28 000 people. The Hives, 30 seconds to mars and Sean Paul performed during the event. Tim Humprehys won the rookie challenge and Daniel Bodin won the freestyle snowmobile contest. 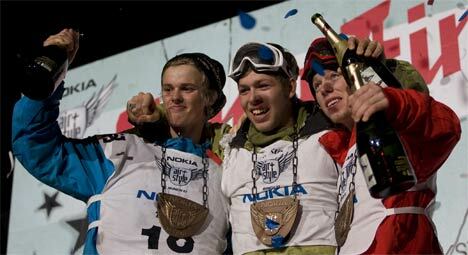 Kevin Pearce, the 20 year old american who entered the Air & Style for the first time won it. The winning trick this year was a combination of Cab 1260 to Crail. Mikkel Bang, 17 years old from Norway, who won the rookie contest last year and by that qualified to the main event this year came in second. Torstein Horgmo who broke his back not long ago, did a great comeback and came in third. The local hero David Benedek came in fourth. Check out the videos below, Quicktime required.